The U.S. military accounts for a staggering 40% of global military spending, but this isn’t anything new, folks. The United States has been experiencing a century of extreme defense spending, and if we don’t slow down soon, this military spending could prove to be our country’s downfall. …All current and capital expenditures on the armed forces, including peacekeeping forces; defense ministries and other government agencies engaged in defense projects; paramilitary forces, if these are judged to be trained and equipped for military operations; and military space activities. Such expenditures include military and civil personnel, including retirement pensions of military personnel and social services for personnel; operation and maintenance; procurement; military research and development; and military aid. So it’s pretty clear military expenses cover quite a wide range of stuff. But just how much has our country spent on defense over the last 100 years? Before WWII, and in times of peace, the U.S. government really didn’t spend that much on defense — only about 1% of GDP. After the war, America found itself smack-dab in the middle of a global fight against Communism, and defense spending was more than 41% of GDP. Since then, defense spending has never returned to anything less than 3.6% of GDP. It spiked at nearly 12 percent of GDP in the Civil War of the 1860s (not including spending by the rebels). It spiked at 22 percent in World War I. It spiked at 41 percent in World War II, and again at nearly 15 percent of GDP during the Korean War. 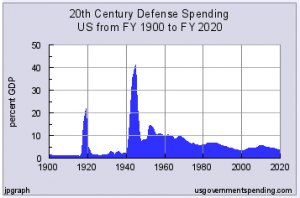 Defense spending exceeded 10 percent of GDP for one year in the 19th century and 19 years in the 20th century. The last year in which defense spending hit 10 percent of GDP was 1968 at the height of the Vietnam War. 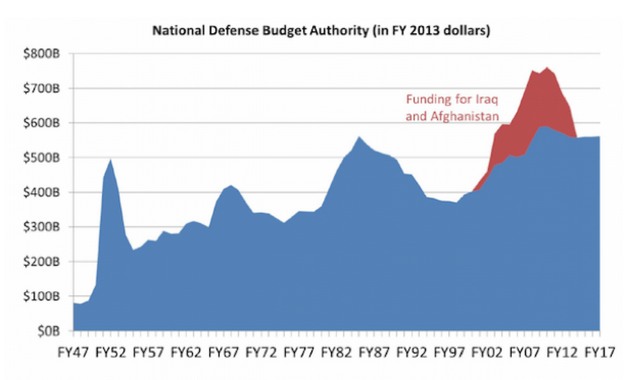 The peak of defense spending during the Iraq conflict was 5.66 percent GDP in 2010. Take a look at this next chart. We see two big spikes for the Korean and Vietnam wars, as well as another significant ramp-up under President Reagan in the 80s. True defense spending, including all the relevant agencies, increased by twice the inflation rate from 2004 to 2014. And, if we look at growth from 2004 to 2010, a year before all those draconian cuts Heritage says we have, then we find that over that period, defense spending increased 60 percent, or three times the inflation rate over that period. In nominal terms, defense spending, including VA, and DHS has ranged from $700 to $850 billion since 2008. Wouldn’t you be ecstatic if you saw your household revenues increase by three times the inflation rate over4 a six year period? Or twice the inflation rate over ten years? I know I sure would. Politicians would like us all to believe that the military has been cut down to size and its budget slashed, but the numbers simply aren’t painting that picture. 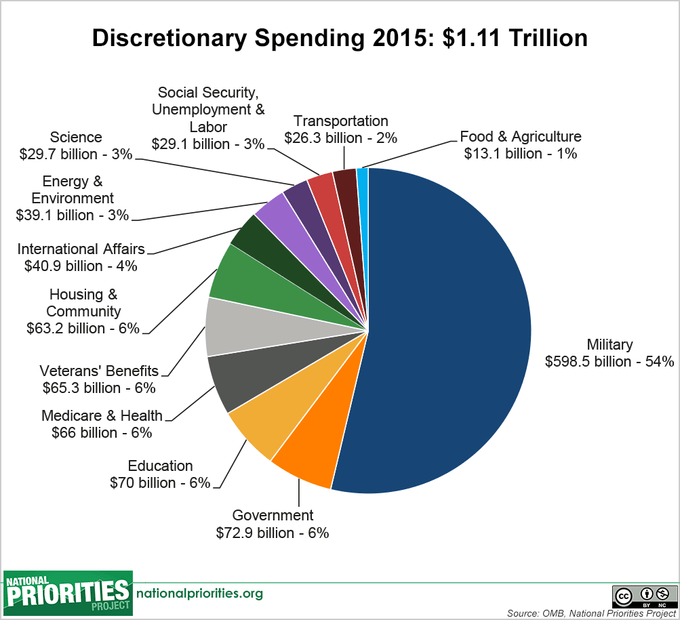 Military spending is as fortified as ever before, and pretty soon it will be gobbling up over a trillion dollars a year if the hawks in Congress get their way. But defense spending tends to be a very touchy subject in this country. In terms of a budget, a lot of Americans would argue that you can’t put a price tag on their safety — “freedom ain’t free,” right? Today we face no rival superpower with massive military capabilities and aggressive ambitions. Threats of terrorism and cyberwarfare are real but stem mostly from small cells, rather than large blocs of countries. Still, defense spending questions are hard to discuss because most Americans hold a jumble of conflicting emotions and perceptions that cloud the debate and shift the focus to almost everything except money. As a starting point, Americans are proud of their country and hold its armed forces in high regard. Yet this respect and admiration for the troops co-exists with doubts about the jobs they’ve been asked to do. Most voters now believe it was a mistake for the U.S. to have gotten involved in Iraq, and most now want to see troops brought home quickly from Afghanistan. 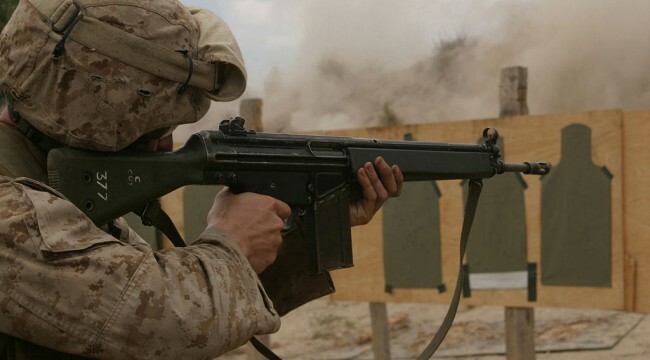 Support for the military action in Libya peaked at 20 percent. So just how much are we spending on the military today? For a quick primer, watch the short clip below for a 10,000 foot view of just how much money the U.S. has spent on war and weaponry, and where exactly it’s going. At the time this video was created in 2012, we had spent $1 trillion on health care over the course of ten years. 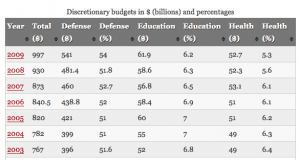 In only one year, the U.S. spent $1.6 trillion on military spending. 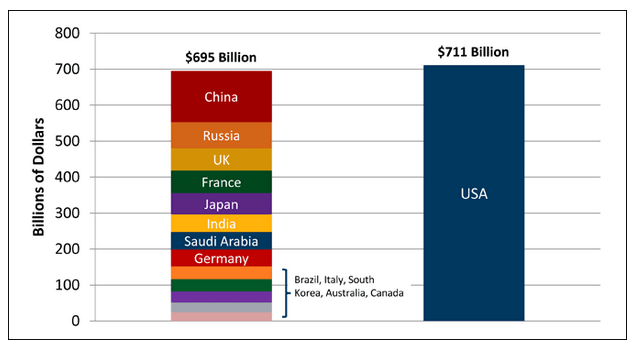 Well, I’ve already told you the United States spends more on defense than any other country in the world. In fact, it spent more on its military than the next 13 nations combined in 2011. But to get down to brass tacks, the U.S. government spent about $718 billion on defense and international security in 2011 — more than it spent on Medicare. That’s including all of the underlying costs of the Pentagon and the hefty price tags for the wars in Iraq and Afghanistan, which totaled $159 billion. According to the Stockholm International Peace Research Institute (SIPRI) the U.S. spent $618 billion in 2013, more than three times the $171 billion budget of second place holder, China. Just when you thought it couldn’t possibly get any worse, defense spending skyrocketed after the terrorist attacks of 9/11. One way of contextualizing the cost is by looking at how fast the national security budget has grown during the last decade. In 2001, the year of the horrific 9/11 terrorist attacks, the federal government spent about $350 billion on defense and veterans’ affairs. If that spending had kept pace with the growth in population and inflation, it would total about $481 billion today. Current spending is 82 percent higher than that. It is no surprise that defense budgets increased after 9/11, but it is legitimate to ask if an 82 percent hike was the right amount. A spending increase of 82% is astronomical. Surely at the time it was deemed necessary, but now, fourteen years later, it seems as though we are hemorrhaging money just for the heck of it. In this new era, traditional military threats to the USA are fairly remote. All of their enemies, former enemies and even allies do not pose a military threat to the United States. For a while now, critics of large military spending have pointed out that most likely forms of threat to the United States would be through terrorist actions, rather than conventional warfare, and that the spending is still geared towards Cold War-type scenarios and other such conventional confrontations. Military spending today, adjusted for population and inflation, is higher than it was when Ronald Reagan left office—a time when the Soviet empire was still pointing nuclear weapons at U.S. cities. It is higher than it was in 1968, when the U.S. was fighting both the Cold War and a deadly hot war in Vietnam. Although Americans will support spending whatever it takes to defend the country, polling suggests they don’t realize how much we’re spending right now. Well, speaking of jet planes… take the infamous example of the F-35. The F-35 is an extraordinarily expensive jet that has never even seen combat. It doesn’t work as it’s intended to, it’s devouring budgets for everything from police to teachers, and it won’t even be ready until 2019 — almost 10 years late. And — you guessed it — it’s all being paid for with American taxpayer dollars. The reason that the US suffers so few casualties in combat is that the US always has the military enemies massively out-gunned. It is not better strategy or the alleged razor-sharp efficiency of well-trained forces. It is, in fact, the air support, drones, armored vehicles, limitless ammunition, limitless gasoline, and overwhelming wealth of the military that makes military operations far less deadly for American soldiers than for anyone else. This, in turn, is what makes war and militarism so much more easily digestible to politics and the American people, and what keeps the money flowing in. Casualties are kept remarkably low. But who’s left picking up the tab? The fact that it is all made possible by the the American worker, who slaves away at his humdrum job to send a third of his income to the feds, is of course totally ignored on Memorial Day, Veterans day, or the other official days of Reverence Toward Government. We might also mention that when tax revenue comes up short, as it always does, the central bank can be relied upon to make up the difference, thus ensuring that the gusher of federal money never stops. And what happens to that money? Much of it is wasted on worthless military garbage like the F-35, and on politically powerful military contractors who produce such things, such as Lockheed Martin. Hey Congress — ever heard of waste not, want not? …the Greek military has 136,000 personnel – that is more than Spain but for a population a quarter of the size. It has been spending more on its soldiers as a proportion of its economy than any other EU member for ten years. Why Greece, a country whose 21st century military exploits includes contributing one hundred and twelve soldiers to ISAF in Afghanistan and one frigate to the Libyan blockade needs a military of 136,000 people is baffling. The United States could easily afford to sacrifice some size in its military, and it’s truly mind-boggling to know such cuts aren’t being considered at a time when our national debt is through the roof, and then some. The two most important public issues of the early twenty-first century were the growth of debt in the United States, both public and private, and the stretch of American military powers around the world. Each of these matters had the potential to ruin the imperium itself and gave rise to vital questions. Why are we meddling all over the world? And, how are we going to pay for all the promises we’ve made? Will the U.S., like some european leaders, accept the fact that a large, established, and mostly unused military is a detriment to economic prosperity? It’s a question our country is going to have to face sooner than later — what would our country look like if we invested these massive military funds elsewhere? What if we funneled billions upon billions into science research, technology industries, the medical world, or education? Would we be cranking out entrepreneurs at the break-neck speed of other countries? Could we be responsible for the next major scientific breakthrough? Back in October, we recommended the iShares Aerospace and Defense ETF (NYSE:ITA). At the time of writing, ITA had shot up 109% since investors originally had a chance to buy in 2010. Even our military historian Byron King backed this choice. With a military-spending-spurred by arms race and no real let up in sight, ITA is likely to continue to be a good choice for investors. Since we wrote to you back in November, ITA has ticked up another 8%. So, while many Americans sit back and watch the parade go by, forking over their tax dollars in a patriotic haze, you can stick it to the man by profiting off the reckless government spending on defense and military ventures. A characteristic of all empires is an elevation of the military caste. The essential business of empire builders is providing security for parts of the world beyond their own homeland — whether the subject nations want it or not. That is a military exercise. Over time, other forms of business and commerce are neglected. But military might rests on economic might. People are generally blockheads when it comes to military adventures. Built into their genes is not only the desire to lord it over their neighbors, but also a deep distrust of anyone who fails to do his duty when the nation is at war. That is one of the things that make empires so attractive. Once underway, they meet with little domestic resistance. As time goes by, not only do other forms of business drop by the wayside, so do other domestic concerns. Everything gets sacrificed to the war gods — even the liberties for which they are meant to be fighting. Ultimately, the biggest threat to United States’ security could prove to be its defense program. P.S. When you sign up for the Daily Reckoning, you will receive just that; timely and entertaining ideas everyday that will help you understand how markets work. Did I mention it’s free? Because it is! Sign up here today to start receiving the Daily Reckoning to your inbox, completely free of charge. Genevieve LeFranc is the Associate Editor of The Daily Reckoning and David Stockman’s Contra Corner. Genevieve holds a BA from James Madison University in writing, rhetoric, and technical communication and a minor in British communications and media. She has lived and worked in London, and as a freelance writer for clients all over Northern Virginia and Baltimore. She writes a column for Foodservice Monthly, runs her own clothing business, and has an eclectic professional background having worked everywhere from the security industry to the fashion trade.